We find legendary reliability in Honda HRR Series Mowers offering dependable performance and outstanding features. The entry of Honda in lawn mower marketplace brought solid built machines designed with new technological techniques. This is the reason many people now prefer choosing Honda lawn mowers when compared to its other competitors in the market these days. Honda lawn mowers support 4 stroke engines built according to environmental issues, twin blade technology, CARB certified and overall the best lawn mowers at affordable prices. Honda HRR Series Mowers comes in push and self propelled categories of the lawn mowers which are very popular among all the types of lawn mowers. These types of mowers are forms of electric walk behind mowers. Push and self propelled mowers are usually used by nature lovers and are also good to keep you fit. The HRR series mowers support 4 stroke GVC160 engines and are one of the most recommended mowers and the best out of all available in the market. Honda's mission is to meet the requirements and expectations of all types of its lawn mower customers by providing new and innovative products and keeping a track of continuously bringing improvement in their line of products. The HRR Series Mowers answers the questions of potential users of lawnmowers introducing the HRR series mowers that are considered safe, efficient, durable and easy to use. HRR series have been launched with three new models manufactured with superior technology and looks afresh in design. Each model has been built with long-lasting decks of steel material, Fly wheel safety system control, GCV160 Honda 4 stroke engines. HRR series mowers are easy to use and give great performances making mowing a pleasant process. HRR Series Mowers includes three models i.e. HRR216VKA, HRR216VXA and HRR216PDA. The general features of HRR216PDA includes it is a push lawn mower, can cut at six different positions and also have single position handlebars. The HRR216VKA is a type of self propelled lawn mower, has SMART drive speed control and also supports a GCV160 Honda four stroke engine which also has an Auto Choke System installed. The HRR216VXA is rated as the best among all three models in HRR series mowers. This model has Roto-stop brake system and easy release 2 positioned handlebars. All models common features include twin blade technology, 4 in 1 capability and also a bagging capacity of 2.4 bushel. 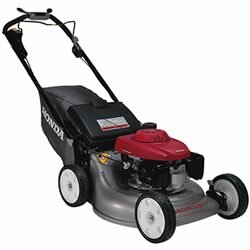 The exclusive features of Honda HRR Series Mowers include SMART Drive (TM) Variable Speed Transmission, Roto-Stop Blade Brake Clutch, EZ grip Ergo-active (TM) Handle, single rear height adjustment feature, four stroke GVC160 engines, a two year extended warranty and also Honda brand valued engineered components. In the Roto-stop feature, there is no need to stop the mower every time the operator is not at the seat; it stops the blades rather than switching the engine off. And the four stroke engine technology makes the mowers quiet, easy to use and start, no mixing of oil and gas and gives long life to the lawn mowers. As everything is supposed to be a blend of positive and negative aspects sae goes true for the Honda HRR series as well. Not everything about these models is good i.e. HRR216VXA SMART drive is considered hard to use by some of the users as it requires more pressure and cannot be handled for more than two hours. The gas tank is not well made and problems related to leakage are also sometimes faced. HRR Series Mowers have a very strong dealership network across the world and also a good repair/service facility available near your town. They also have a warranty of three years and some of the models have 5 year warranty. Honda's commitment to give quality, durability and efficient performance through its products has made it a strong competitor in the market and so far it is considered leading the race. Lawn mower wheels do not break very often but need to be replaced at once if a problem is discovered in them. No matter the mower is manual or electric oil is always applied as it acts both as a lubricant as well as a coolant for the engine. Mainly two types of the lawn mower batteries are frequently being utilized in lawn mowers which are the lead acid batteries and the nickel cadmium or Ni-Cad batteries. Lawn mower tires are an important part of lawn mowers.